Old gold mining service town now a tiny settlement. Mount Surprise is a tiny settlement (no more than a pub, a couple of cafes, a caravan park and a couple of service stations) located on the Gulf Development Road. There is little of importance to see in Mount Surprise. The appeal and importance of the area lies in the attractions which surround it. The town's two attractions are the Mount Surprise Railway Station and Mount Surprise Gems. Beyond the town lie the Undara Lava Tubes, Cobbold Gorge and the gem fossicking area at O'Brien's Creek. Mount Surprise is located 1,710 km north-west of Brisbane via the Gregory Highway, 319 km south-west of Cairns and 393 km east of Normanton on the Gulf Development Road. It is 453 m above sea-level. The Etheridge Railway and the railway stations at Mount Surprise, Einasleigh and Forsayth, and the railway reserve between Mount Surprise and Forsayth is all listed in the Queensland Heritage Register. The reasons include: "The Mount Surprise station complex has the most intact group of railway buildings, and its station building, goods shed, small timber shed and water tank are all good examples of their type. Other elements, such as two railway houses, a trolley shed, sandbox, sidings, turning fork and signals and points levers all contribute to an understanding of how a rural railway station functioned. The shower under the water tank illustrates the past lifestyle of railway workers." and "The railway stations at Mount Surprise, Einasleigh and Forsayth and the route of the Etheridge Railway between Mount Surprise and Forsayth, including surviving railway buildings, rails, sidings, turning forks, loading banks, stone pitched bridges and culverts, stone cuttings, sandboxes, water tank, signage, and signals and points infrastructure, are important surviving evidence of the efforts of the Chillagoe Railway and Mines Company to supply copper ore to its smelters at Chillagoe." It was a private railway which was built between 1907 and 1910 and was part of the business empire of John Moffat. The history of the line is fascinating. "The line was opened to Mount Surprise in May 1908, and the railway station at Mount Surprise (108.5km from Almaden) was named in December 1909. In 1916 Mount Surprise station had a gate, siding, telephone, scales, fork, cattle yards, and a horse and carriage loading bank. By 1932 it had a station building, closet, goods shed, loading bank, motor shed, camping quarters, two fettler's quarters, enginemen's quarters, coal stage, and cattle yards. Mount Surprise became an important cattle trucking centre after 1951, with the reconditioning of the line from Almaden for steam locomotives. In 1970 approval was given to erect the railway station building from Tumoulin at Mount Surprise as a cottage (removed 2008). A repair shed for the Savannahlander tourist railmotor and an interpretation centre were built in the mid-1990s." There is more detail at https://environment.ehp.qld.gov.au/heritage-register/detail/?id=601637. Located in Garland Street (the Savannah Way) and proudly proclaiming itself "the only 'true gem experience' in far North Queensland, Mount Surprise Gems is a combination of cafe; a place where gem-bearing wash can be sieved; a source of equipment needed for fossicking at O'Brien's Creek; a gem shop with a range of faceted gems; and a place where lapidary is discussed and demonstrated. It also a Post Office. They have an excellent website - http://www.thegemden.com.au/index.html - and can be contacted on tel: (07) 4062 3055. Located 67 km to the east of Mount Surprise, and covering 6,330 hectares, the Forty Mile Scrub National Park features ancient and recent volcanic flows, open grassy woodland, the headwaters of several creeks, and a near-threatened, isolated pocket of semi-evergreen vine-thicket. The first indication that the traveller gets is an awareness that the vegetation on either side of the road has changed. There is a density and richness which is not characteristic of the region. Forty Mile Scrub National Park is a relic of an ancient rainforest which has remained virtually untouched for millions of years. It has a bewilderingly rich variety of flora species - some say the greatest concentration anywhere in Australia - and it is an area which is used to support the theory of continental drift. The rainforest has parallels with similar rainforests in India and Burma suggesting that, at one time, the Australian and Asian continents were linked and that over millions of years they have gradually drifted apart. The park is primarily designed to protect the fauna and flora. Consequently there is a day use area, camping is not permitted, and the only walk is the short Forty Mile Scrub circuit walk (it is 300 metres and takes around 10 minutes) where there are informative signs in a section of stunted forest. It is located adjacent to the day use area. For more information check http://www.npsr.qld.gov.au/parks/forty-mile-scrub/about.html. Historically Mount Surprise was the starting point for people wanting to visit the lava tubes. Today the Lava Tubes have their own accommodation, eating and tour groups. Geologists estimate that the lava tubes were formed 190,000 years ago. The lava flow covered 1550 square kilometres of north Queensland. At the time the whole region was dotted with active volcanoes. It has been estimated that there were 164 volcanoes, vents and cones in the larger McBride Volcanic Province of which Undara is part. Seemingly nonstop eruptions produced the Atherton Tablelands which lie to the north. The volcanoes were responsible for the rich, deep soils which make the Atherton Tablelands so agriculturally productive. There are two specific branches which form the Undara Lava Tubes - one runs for 16 km and the other for possibly as much as 28 km. Over time the tubes have collapsed at various points. These collapses have left huge dents in the landscape which can be seen from the air. They look like dark depressions because they have become heavily vegetated. They are best seen from the helicopter flights which leave the Undara lodge upon demand. The Undara Tubes are open to the public but they can only be explored by joining one of the organised tours which leaves from the Lodge. There are three tours available: The Archway Explorer (2 hours, easy fitness, boardwalks) starts at the Lava Lodge Reception at 10.30 am and sometimes goes at 8.00 am, 1.00 pm and 3.30 pm depending on demand. The Active Explorer (2 hours, moderate fitness, uneven surfaces) starts at the Lava Lodge Reception at 8.30 am, 10.30 am, 1.00 pm and 3.00 pm. And the Wildlife at Sunset Tour, which leaves from the Lava Lodge Reception between 5.00 pm and 6.00 pm, and which is an easy fitness level, lasts around two hours, passes across boardwalks, steps and involves a little uneven climbing. The great attraction of the Sunset Tour is, as the website explains: "Thousands of tiny insect eating micro-bats emerge from the darkness to find food which attracts Pythons and Brown Tree Snakes that hang from the trees and strike out at the bats to capture a meal. This once in a life time nature experience runs all year but is at its spectacular best in the Summer Green Season!" The tubes themselves are vast and access is remarkably easy. It is never anything more than a walk down a stable scree slope into the tube. The area around the tubes is typical scrubby savannah bush country with pandanus, ironbarks, white-barked gums and cabbage gums mixed with remnant rainforest - known as semi-evergreen vine thicket – which occurs in the mouths of the caves. As the National Parks website explains: "Semi-evergreen vine thicket grows in the moist, sheltered entrances to some of the lava caves. The roofs of some tubes collapsed, creating ideal conditions for dry rainforest to grow and wildlife to shelter. Rock-wallabies, insectivorous bat colonies and owls roost here in the cool. Birds shelter in the fruit-filled canopy and predators lurk in the tumbled basalt terrain to complete the food chain." Some visitors prefer to make their own way and do their own exploring. At Undara this is really only possible in a very limited sense. There are a total of eight walking tracks around the Lodge ranging from 1.5 km to 12 km. Not surprisingly they range from easy to moderate-steep. They are difficult in the summer months because of the heat and they are mostly about walking from one lookout to the next and enjoying the views over the lava plains. There is a walk to the top of Kalkani Crater and one around the edges of the 100 Mile Swamp – which, not surprisingly, is not very swampy in the dry season. There is a detailed list of all the walks, complete with a map and descriptions of the walks at http://undara.com.au/activities/bush-walking. The logic of only providing organised tours is a model of eco-tourism. A bus with twenty people is much better than dozens of 4WD vehicles damaging this very delicate ecosystem. This important topaz field is 42 km north-west of Mount Surprise on an unsealed road. Ask at Mt Surprise Gems when hiring the equipment. They have mud maps and information on how to get to the gemfields. As well they will show visitors how to use the equipment, what to look for, and they will cut and set stones. Check http://www.thegemden.com.au/fossicking.html. The website includes a three part video of how to fossick for gemstones at O'Brien's Creek. It can only be accessed by 4WD. Located 97 km west of Mount Surprise is Georgetown (check http://www.cobboldgorge.com.au/about/the-gorge.html and watch the video) and 92 km (40 km of dirt road) beyond Georgetown is Cobbold Gorge. It can only be visited by guided tour from Cobbold Gorge Village. The sandstone gorge, claimed to be the youngest in Queensland, was created over the past 135 million years and modified significantly as recently as 10,000 years ago. The narrow ravines (some as narrow as two metres) have carved out deep gorges and permanent waterholes below towering cliffs which, in some places are 30 metres high. The gorge is home to harmless freshwater crocodiles. There is a detailed account of the accommodation, tours and scenery of the area at http://www.cobboldgorge.com.au. Located 70 km south of Forsayth, the Agate Creek Gemfields were established by the Department of Mines and Energy in 1995. There is detailed information on the http://www.thegemden.com.au/fossicking_information.html website which explains that the area is known for "Cryptocrystalline Quartz is the umbrella encompassing agate (silicon dioxide SiO2) which is a variety of chalcedony. Nodules or solid agates and geodes occur. Many of the geodes being filled with clear, smokey, amethyst or calcite crystals. Thunder eggs are also common in the rhyolite and may contain red brown jasper." It is accessible in a 2WD in the dry months but a 4WD is necessary if there has been heavy rain. * Prior to the arrival of Europeans the area was home to the Agwamin Aboriginal people. * The town was first settled by Ezra Firth in 1864. He took up 300 square miles of country which he called Mount Surprise. * In 1872 William Hann's expedition passed through the area. * By the 1880s Firth was near bankrupt when the goldrushes to the Gilbert, Palmer and Etheridge Rivers created a situation where he could sell his sheep to the miners. He then converted Mount Surprise to cattle. * In 1908 the railway reached Mount Surprise. The Railway Hotel once stood where the Mount Surprise Hotel now stands. * A post office was opened in the town in 1908. The unofficial Visitor Information for the area is at either the Bedrock Village Caravan Park, Garnet Street, tel: (07) 4062 3193 or Mount Surprise Gems, Garland Street, tel: (07) 4062 3055. The Mount Surprise Gems website - http://www.thegemden.com.au/index.html - is particularly useful for fossicking and the attractions in the area. Mt Surprise Hotel in the main street. 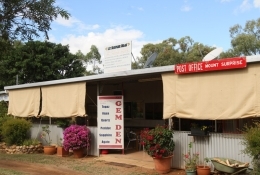 Mt Surprise Gems - hire equipment, have fossicking lessons, buy finished gems and it is a Post Office as well. Mt Surprise Railway Station (1908). It is heritage listed. Cobbold Gorge - so narrow you can touch the sides.